David Willey gave another pulsating demonstration of the talent which has won him international recognition when his second century of the season kept Northants in the LV= County Championship Division Two match against Derbyshire. 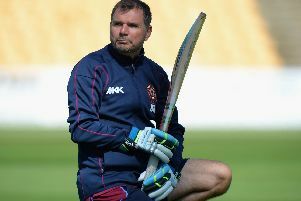 Northants head coach David Ripley had encouraging news regarding Wakely and Cobb. “Alex has been for an X-ray on his hand and it didn’t show a break so hopefully with another day of ice and rest we can use him on the last day.